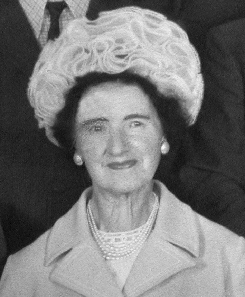 On 13th June 1976 the Dumfriesshire & Galloway Natural History & Antiquarian Society lost one of its most valued members by the death of Mrs Mary McLean ("Molly"). She had served the town for many years on committees including those for Social Work, Health, Roads and Drainage, Cleansing & Parks and bodies concerned with Old People's Welfare & Children's Homes as well as being a member of the Museum Committee from 1954. From 1949 she served the Museum as a Council member and was deeply involved in the establishment of the substantial Period Costume & Dress Collection. It would be difficult to find any worth-while project that did not benefit from her suggestions backed by real hard work. Through her professional contacts as County Librarian and as a member of the Scottish Library Association she had a wide and accurate knowledge of places and people with antiquarian interests. It was a fitting tribute to her general attributes that she was elected President of this Society the only woman so honoured in 100 years - and she held that post during the Centenary Celebrations. She discharged all her many obligations with an effortless pleasantness that concealed the many hours of work that were involved. Those who knew her will not easily forget her capacity for service and her talent for friendship.